When the Declaration was adopted, it was read in different American cities and whenever people heard it they reacted very enthusiastically. For instance, in 1777 in Philadelphia, people fired guns, set off firecrackers, rang bells and lighted candles. Celebrations were modest until the end of the war, but after 1783, July 4 started to become a big holiday. Such activities as picnics, eating contests, historical pageants, baseball games and trips to the beach became traditional for the celebration of the 4th of July. Common foods taken to the picnics include corn on the cob, coleslaw, hot dogs, clambakes, and hamburgers. Even though the 4th of July is celebrated all over the country, such cities as Philadelphia and Boston draw visitors from many states. Usually Boston Pops Orchestra has a televised concert and the USS John F. Kennedy sails into the harbor in Boston. Philadelphia celebrations are held at Independence Hall, where you can hear the Declaration of Independence read aloud. You can also visit Flagstaff in Arizona, where American Indian rodeo is held. Lititz, Pennsylvania, can offer you an interesting event called a candle festival. Hundreds of candles are put in the water where they float and form a beautiful sight. 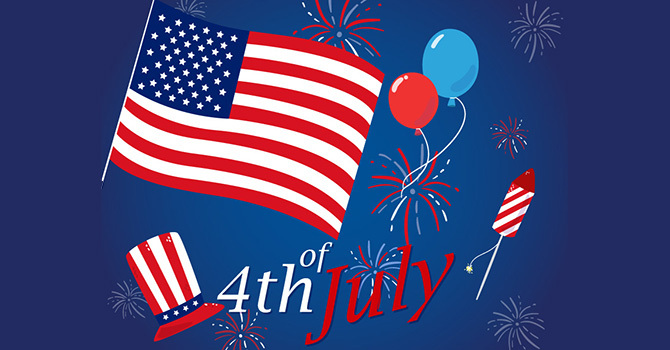 John Adams, who was the second president of the US, in a letter to his wife foresaw that the 4th of July would be celebrated with shows, parades, speeches, games, bonfires, games and illuminations. Needless to say – he was right! The first man to sign the Declaration was John Hancock. Since that time, when people are asked to leave their “John Hancock,” it means that they should sign their names. We need to remember that those 56 men, who signed that act, were the embodiment of courage, because what they did was an act of treason, which could have led them to severe consequences.Interestingly, with the passage of time, the Declaration has turned into one of the most copied documents of political nature. This document is a mixture of political and philosophical statements because on one the hand, it proclaims Independence and on the other, it includes such topics as God, free will, and human nature. This is indeed a magnificent document, which had a great impact on thousands of freedom-seekers in all corners of the world.